Stewardship --- Learning to make the best use of limited resources. He considers time to be the most essential resource. Whether it’s your time or your associates’ time, you can’t make any more! We’re all allotted the same 168 hours in a week. Visioning --- Leaders must develop clear personal (Self-Mastery) and organizational vision. Leaders must set personal and organizational goals and take the steps necessary to achieve the desired outcomes. Persuasive Communication --- Leaders value healthy communication and understand that the best ideas don’t always come from the “front office”. Empowerment --- Leaders focus on power with people instead of demanding power over people. Leaders must care for the development of the “whole person” and not simply focus on work performance. Service --- Leaders understand that their jobs depend on their ability to motivate and retain the best associates. Leaders help set the goal, assist the process, and in the end, say Thank you. Compare the above with the following statement from one e-mail, “To instruct is to relay or transfer information or ideas to another person. This is just the first layer of the instruction process. To transfer knowledge differs from just speaking forth information or ideas. To transfer knowledge the instructor needs to be intimate with the material at hand (Persuasive Communication). An instructor needs to come from a place of experience in order to have credibility with the student (Self-Mastery). This (creates a) symbiotic relationship in which each participant desires to do their best to create an environment that is conductive to learning (Empowerment). In each and every e-mail, the writer made reference to the need for the instructor to have “the love of the Art”. One writer added, “Someone who understands the Art and looks beyond their own thinking of “this is the only way to do it.” A fully qualified instructor is someone who can relate to every type of student, whether 9 years old or 90, and who can get those students to think for themselves and make the Art their own (Persuasive Communication, Stewardship).” Finally, the commentator went on, the art has not truly changed since I started in 1984 but the increasing levels of refinement continue (Visioning). 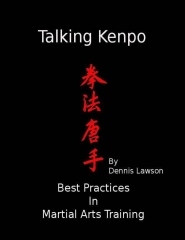 As Mr. Parker said “Kenpo never changes, it is perpetually refined.” I was very lucky in my early training to be on the mat with a great many people who loved the Art, first and foremost, Mr. Parker. So yes, I have been spoiled when it comes to “qualified instructors” I have been blessed with great ones.